To celebrate the British tradition that is Afternoon Tea, chef Nigel Mendham and the independently owned boutique hotel, DUKES LONDON, are delighted to introduce the afternoon tea of all afternoon teas. The Ultimate Afternoon Tea at DUKES LONDON has been created using the finest ingredients presenting traditional favourites with an exuberant twist. Guests and locals alike can enjoy the opulent surroundings of the DUKES PJ Lounge as they sip Perrier-Jouët Belle Epoque champagne and sample exquisite miniatures. These include a selection of sandwiches from Iberico bellota and heirloom tomato and Formans smoked salmon and Royal Beluski Caviar to Dry aged beef with alba white truffle. Delights such as Amedi porcelona chocolate delices; Pistachio macaroons with gold leaf; Saffron madelines; Fairy cakes; Vanilla & apricot scones; Coffee and marscapone panna cotta and exquisite Chelsea buns are also part of the gourmet tea time experience. The Ultimate Afternoon Tea at DUKES LONDON is available for £195 per person however, for those looking to share the experience or celebrate a special occasion with friends or family, groups of four or more can relax in the privacy of their own company with exclusive use of the PJ Lounge. 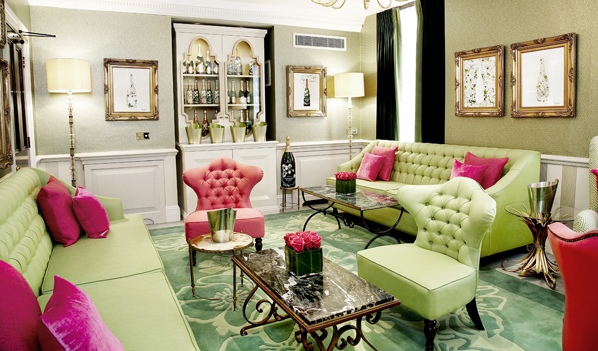 DUKES LONDON won the title of World’s Ultimate Service Award in Hospitality at the World Travel Awards in 2011.